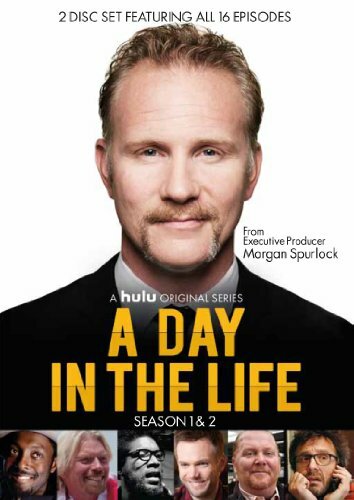 Morgan Spurlock, the Academy Award-nominated director of Super Size Me, has spent the majority of his career turning the camera on himself, inviting the audience to be a part of his own life experiences. Now, in A Day in the Life , he refocuses his lens on the most innovative and intriguing individuals in our cultural and business landscape. Spurlock allows the audience to experience what it's like to be at the pinnacle of an exciting and extraordinary career by being a fly on the wall during the course of a typical day for these leaders. Each episode of this series - the Hulu web service's first original production - goes behind the scenes for a day with celebrities, musicians, comedians, dancers and entrepreneurs, including Richard Branson, will.i.am, Mario Batali, Joel McHale, Marc Maron and Questlove. The series, said The Associated Press, "hints at a bright new day for Hulu." This two-DVD set includes all 16 episodes of the first two seasons.